My name is Sapam Gobin Singh. I am from MANIT 2007-11 ECE batch. I was diagnosed with a chronic kidney disease called IGA NEPHROPATHY stage IV in sept/Oct 2015. I was on medication since then. But two months back i.e 1st week of April this year my health deteriorated and I was rushed into Fortis Hospital Vasant kunj New Delhi. 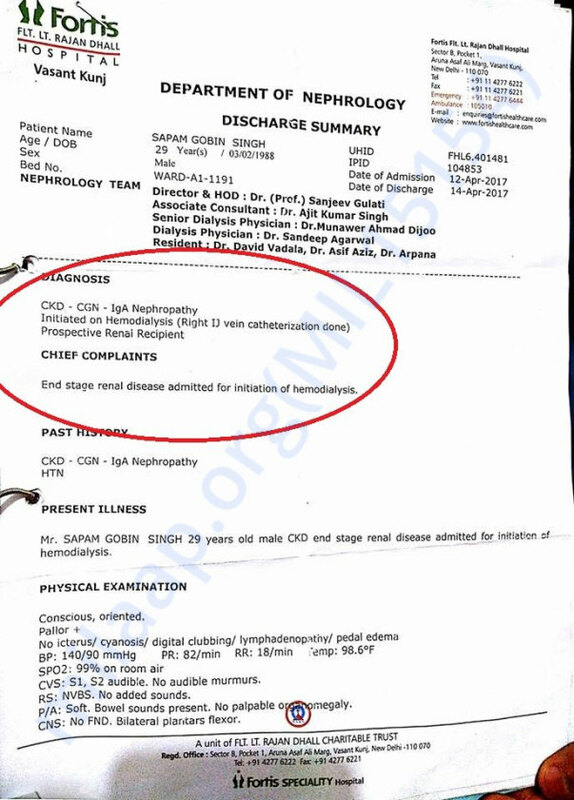 Now I am at end stage kidney failure and transplant is need as soon as possible.For time being I am on Dialysis twice a week as a day care patient in Fortis hospital.The cost of transplant will be around 13 lacs (excluding the charges of Dialysis and costly injections reqd to apply after every Dialysis which already cross 2 lacs till now). There are medicines which needs to be taken lifelong after transplant for recovery and to avoid organ rejection. This will be a costly affair too. I worked as a system engineer in Infosys from june 2011 till Aug 2014 and quit after that for pursuing my interest on UPSC and state PSC exams. Right now I do not have any job and my mom is the only earning member in the family. It's very hard for us to meet all the expenses ourselves. Presently we are managing our hospital charges by taking loans from our relatives. I request all my seniors and friends to kindly help me in this transplant and make me live a normal life. I will be forever indebted to you. Thank you. After delaying for more than two months of scheduled surgery due to back to back bacterial and fungal infections, persistent fever, doing rounds of the hospital every other day. 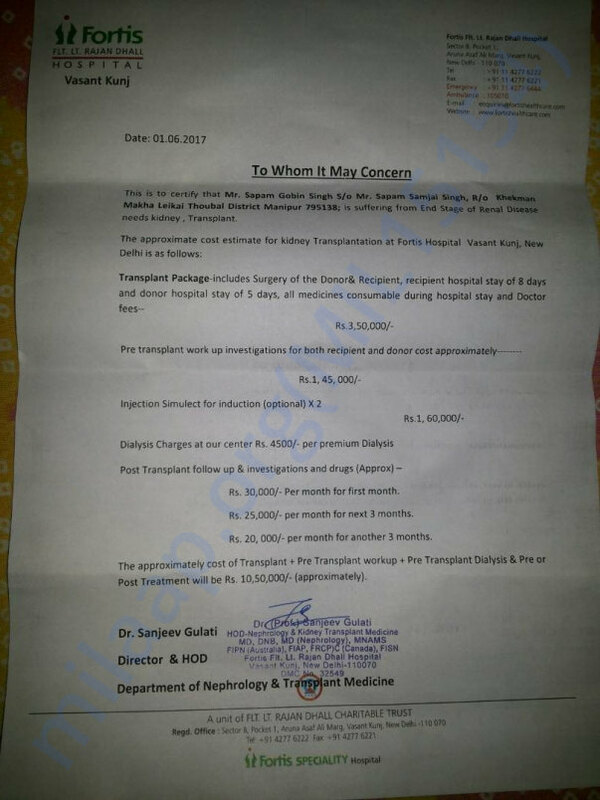 Finally, I am happy to inform you all that transplant was done successfully on 14th of August. Both donor and recipient are doing fine. The newly transplanted kidney is working as expected. All this would not have been possible without you. Thank you for all your love, support and care, I will be forever grateful to you. 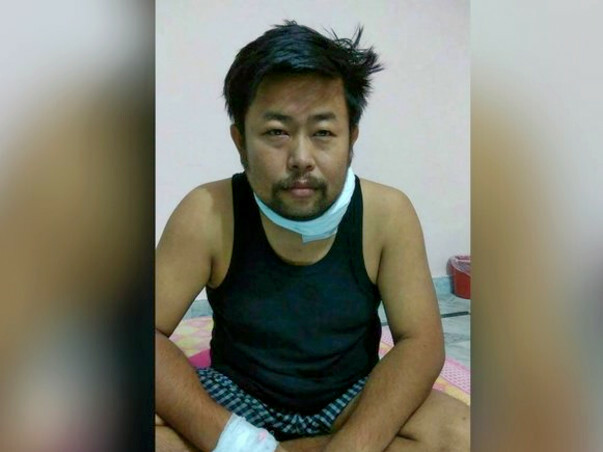 Here is an update on Sapam's health. 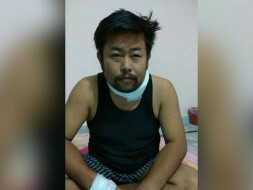 His transplant was initially scheduled on 1st July but due to bacterial infection and fever, it was postponed. He has been on medication since. His transplant has been scheduled for the coming Monday, (14th August). His sister is going to donate her Kidney to him. He will be hospitalised tomorrow with his sister to conduct the pre surgery tests and check ups. Thank you for the overwhelming love and support. Will definitely keep you posted further. Please do pray for the operation to be a success. There is a slight delay in transplant schedule. I had an infection two weeks back that leads to shivering and Fever. Antibiotics doses have been completed today. But there is still mild fever that coming and going. Once it is completely cured there will be a fresh cross matching test. If all went good, the date for transplant will be decided immediately. Hope everything goes well and wishing you a speedy recovery.